I think it’s fair to say I like reviewing things. I’ve done dozens of them over the last year and a bit for games and models of varying types. I’ve even reviewed a couple of games and the odd film. But I’ve never done figure storage. Figure cases are a funny thing and, like scenery, are often considered to be something gamers have to purchase rather than something they want to purchase. This has always been true of me growing up with Games Workshop games and only, at the time, being aware of Games Workshop cases which meant £36 on something big bulky and inflexible. In GW’s defence their figure storage system has become a little bit more flexible but a lot a lot more expensive. Enter KR Multicase. Now Daryl Elms, aside from being a bloody nice chap, is rather clever. Originally an engineer he’s got, to coin a phrase, know-whats. And he’s put them to good use developing the KR Multicase system. So, first up, let’s take a look at the Aquila 1 & 2 cases. The smallest cases in the range, the Aquila 1 & 2 are you definite skirmish cases. The case itself is padded tight weave fabric making it very durable but light and flexible. This may seem like a bad thing but flexibility means the case and sponge moves around the models if the case gets dropped. With hard sponge it leaves nowhere for the models to go and that’s when breakages occur. Such is my commitment to the cause I put my beloved Mordheim warband, including my Finecast Ogre Maneaster and a few other bits, in the Aquila 1 case and tossed it around like the proverbial Frisbee. I even dropped it on a hard wood floor. Although that was an accident albeit a useful one. And I can honestly say that nothing broke. The models had moved around within their slots but this, as I mentioned, is by no means a bad thing. The movement prevents the models from being crushed by the very thing designed to protect it as can often be the case with hard foam systems. The great thing about the Aquila cases is that if all you want is to transport is a warband then you’re sorted. If, however, you’re taking one for a mate then all you do is take the two trays that your models are tidily stacked in and stuff them into your Aquila 2. Exactly the same trays, essentially the same case, just wider to accommodate the extra tray. 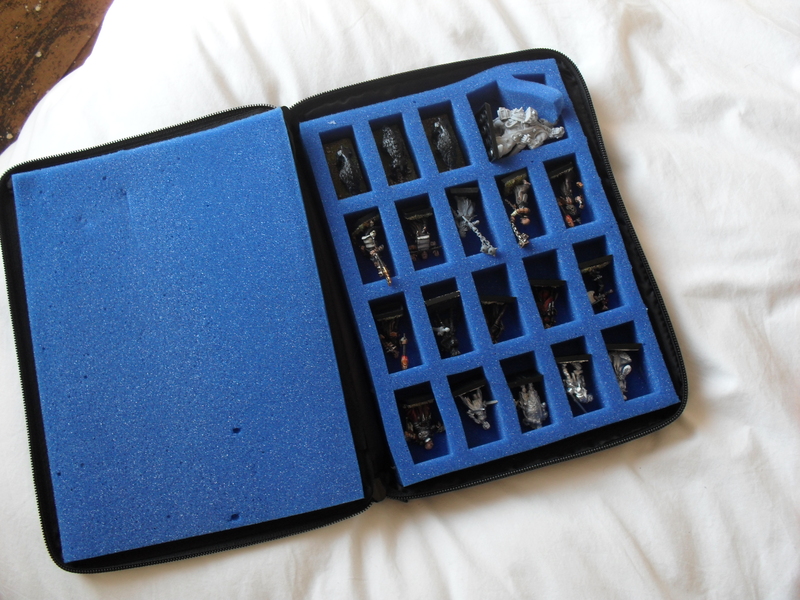 But the point is by working to standard tray size it means that you can take what you actually need in a sensibly sized case which means you get put two warbands, or a warband and miscellaneous beasties, in a single case which you can confidently put in a backpack with all your rulebooks, safe in the knowledge they won’t be smashed to a flobidigillion pieces. But, more to the point, by having your toys and books in a single space you have hands free to carry many beers and munch to the game. Which is only going to win you friends. Now for the bit that people care about. The price. A Aquila 1 will cost you less than £15 and you can carry 20 blokes. The Aquila 2 is £19.99 and that’ll be 40 blokes. Or, to put it another way, a 1,000 point Space Marine army. It’s arguably less value than a GW case as that’s £36 for 109 slots but if all you want to do is take 1,000 points of Space Marines then you’re wasting half the case or taking the entire company with you. But you’re getting a far more durable and attractive case that doesn’t have stupid snap shut clasps that break far too easily. You’re also paying for the modular approach that I mentioned as, for a few pounds each, you have the option of buying multiple trays which you can store and only use the case you actually need which, in the long run, saves money and space. I’ve got to say having dropped the Aquila 1 on a wood floor with my Witch Hunters in and being utterly surprised that they survived unscathed I’m completely sold. Throw in the modular system and the fact that there’s a case and tray for every occasion and it’s a very good, very viable and very affordable way of storing your models. I really should get my lazy arse in gear and actually get a couple of these since aside from an ancient GW case my armies are still transported in shoeboxes stuffed with toilet tissue! 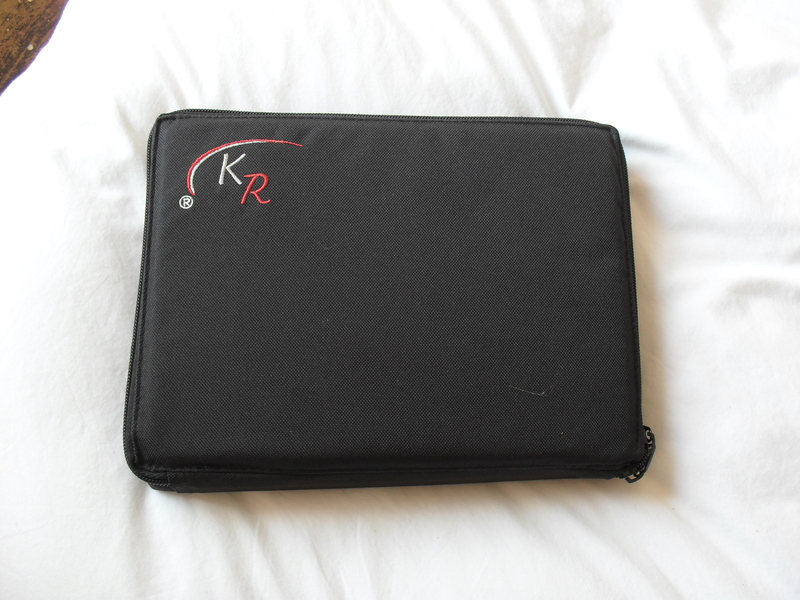 Love my KR case, they are great for the price!